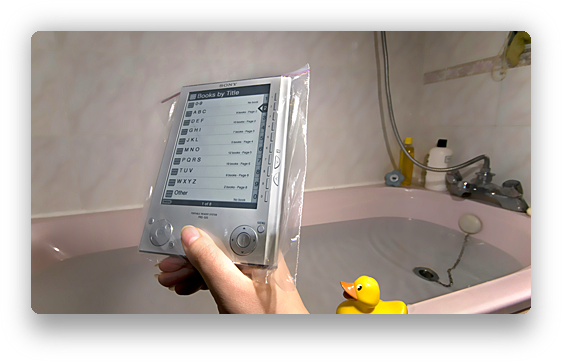 A cheap, effective waterproof case for the Sony PRS-505 / PRS-700. Fancy reading your e-book in the bath? Your long wait is over — I have the answer (cue long drum roll). Hours of selfless testing has proved its worth, and it’ll cost you pennies. 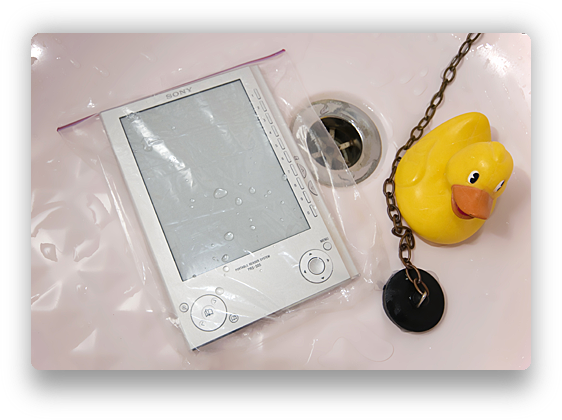 Ladies and gentlemen, I give you, the Sony Reader waterproof case! I wouldn’t immerse the whole thing in water (so don’t use it if you have a tendency to nod off in the bath), but it’s certainly proof against splashes. It’s so effective because with an electronic book, you don’t need to physically turn the pages, so having it inside a plastic bag is no hassle at all. In my next article, I discover a simple solution to the common cold. Maybe.